What are small businesses? Small business are privately own businesses that have fewer workforce compared to regular sized businesses. Most people prefer having small businesses and decide in the long run if they want to expand. Even if it is called a small business, it is still not very easy to acquire funds to start one and keep it running. This is when small business owners look for potential investors. Investors play an important role in business as they become a reliable source of finances for small business owners. To get investors for small businesses, business owners or sponsors create and provide an investment proposal. The investment proposal will serve as the investor’s basis of information to decide whether to invest in the business or not. Let us discuss further about investment proposals and how they are able to help small businesses. Samples and templates are also available for your reference. 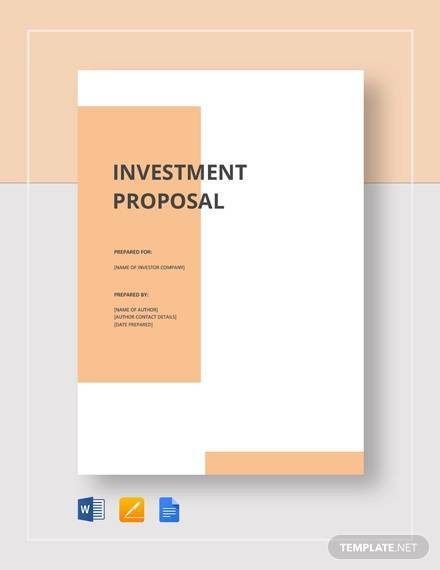 An investment proposal is a document that is presented to potential investors of a business. 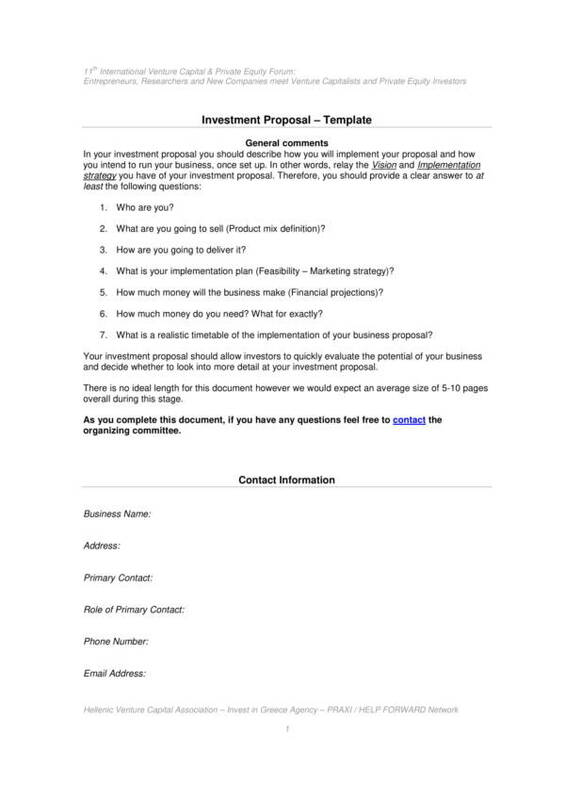 The business owner, sponsor or manager created the document with all the necessary details that potential investors must know about business they are about to invest in. An investment proposal should be extremely detailed and it should also be written in a way that can persuade potential investors to invest in the business. 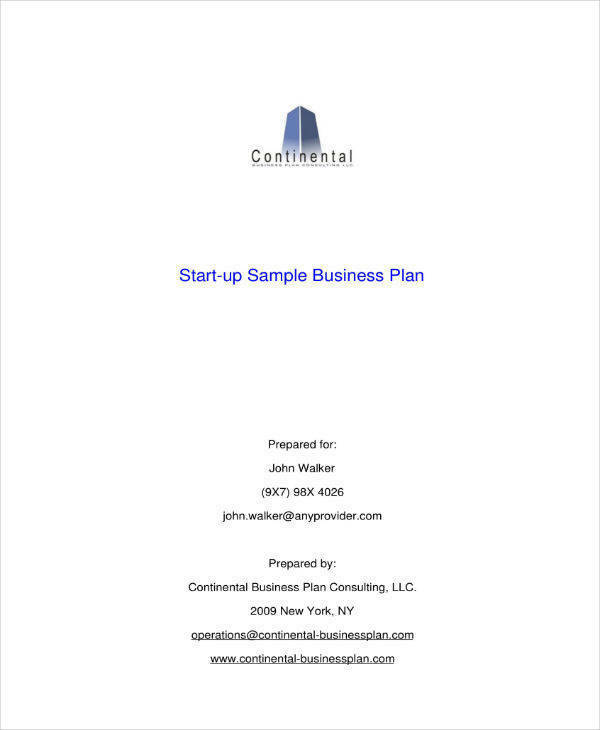 It includes details about the nature of the business, the history of the business, the goals and objectives of the business, any potential for growth, the level or amount of finance required, how secured the invested money will be, and the plan, schedule and interest on how investors get paid for their investment. To let investors know that a particular business is need of potential investors. To find the right investor that shares the same goals and objectives as the business. 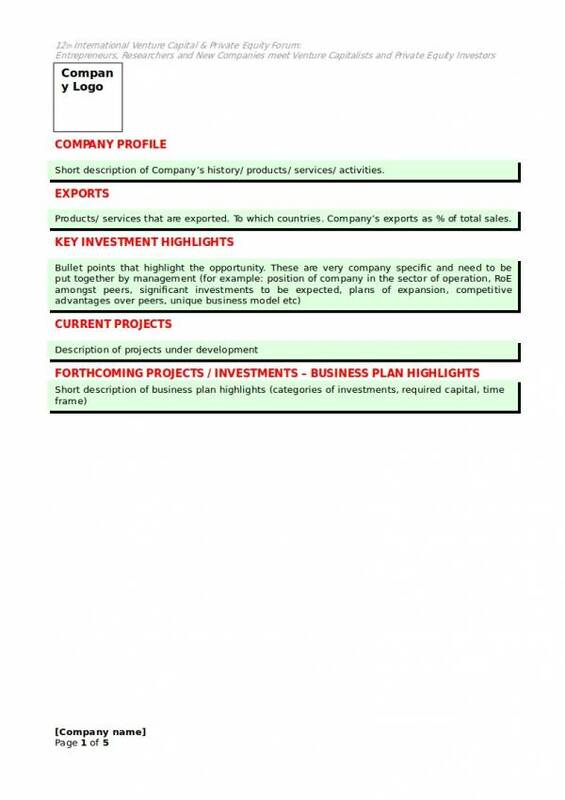 To provide a detailed document outlining the important information related to the business for the sake of letting investors know what the business is all about. To serve as a basis of information of any potential investor. To persuade potential investors to invest in the business. To tell or convey to potential investors that it will be a good choice to invest in the business and that their money will be put to good use. 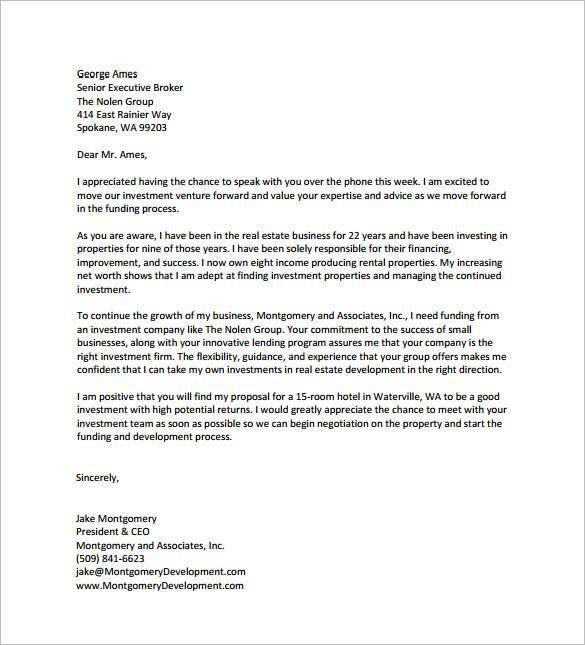 To let potential investors know the benefits that they can take advantage of if they invest in the business. Investment proposals have many more uses and they mostly depend on how they are going to be used and presented to each potential investor. 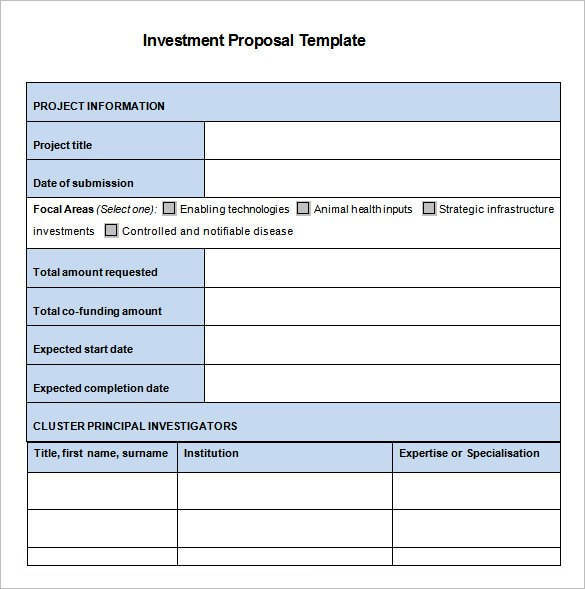 If you would like to learn more about investment proposals, some articles that we recommend are Startup Investment Proposal Samples & Templates and Business Investment Proposal Samples & Templates. Finding investors for your small business is not as hard as it was before. It is simply because a lot of people have money to invest and earning without doing anything is something an investment can do. The question lies in how do you get people to invest in your business? If you want to find out the answer then you might want to check out the list we have made below. 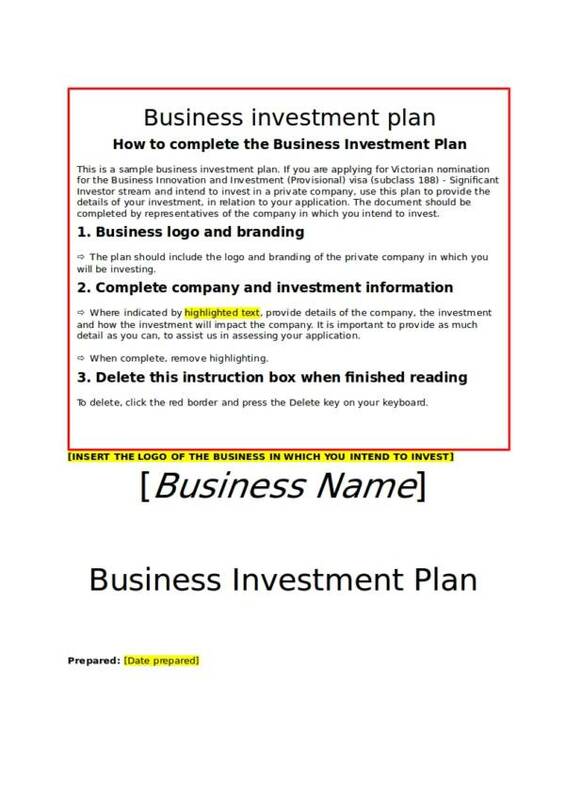 You will need to have a well-thought-out business investment proposal. How can you do that? Show specific and actual numbers about the business, including useful examples that will lead your investors to think that your business will really work. Demonstrate to potential investors that the capabilities of your business in earning a profit or its profit potential. This is one of the things that your potential investors would really want to see in your proposal. Use statistics and actual numbers to show and prove to your potential investors that the products or services that your business offers are growing and that there is a constant demand for it in the market. Always have a marketing plan to present to your potential business investors. The marketing plan will also serve as proof that your business will definitely work using the marketing plan that you have laid out. It is not just in the proposal that potential investors solely base their decisions in. Another factor that they consider is the capability of the business owner to run the business as plan and if they are reliable when it comes to business. With this, you as the business owner will need to specify your strengths or write about your experience in the business. Explain to your potential investor your qualifications to run the business. Provide an explanation how you plan to run the business as well as the necessary functions that it needs to undertake. Tell them how products or supplies will stored, delivered, etc. Finally, the budget. This is the part where your investors will mostly focus on provided that everything in your proposal is favorable so far. You need to be clear about the budget that you need for the first year and the succeeding years. Also make sure to provide a payment scheme or payment schedule on exactly when your investors will get paid and how they are going to be paid. These are some useful ways on how you can get people to invest in your small business. You can follow all of the steps or incorporate your own ways in it. You may also check out other related articles, like Property Investment Proposal Samples & Templates and Real Estate Investment Proposal Samples & Templates. 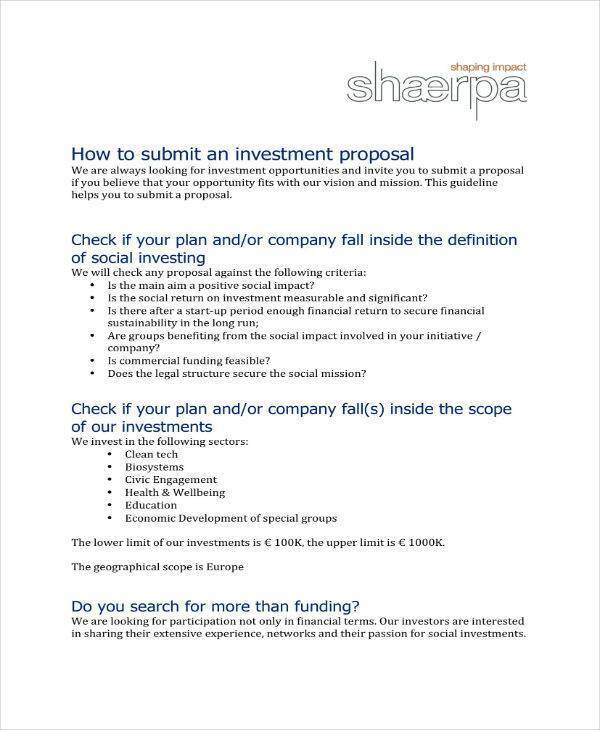 What are high quality investment proposals? 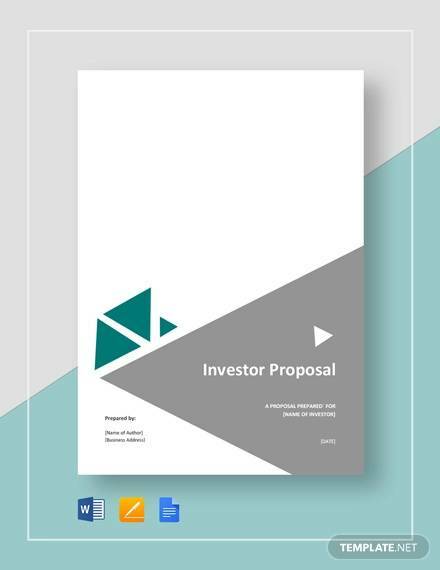 They are proposals that are not only extremely detailed, but they are also the type that will surely persuade potential investors to make an investment the very first time they read it. Now, that sounds like a very powerful tool. If you want to learn how to make a high quality investment proposal, then will definitely need to know the elements that make up one. 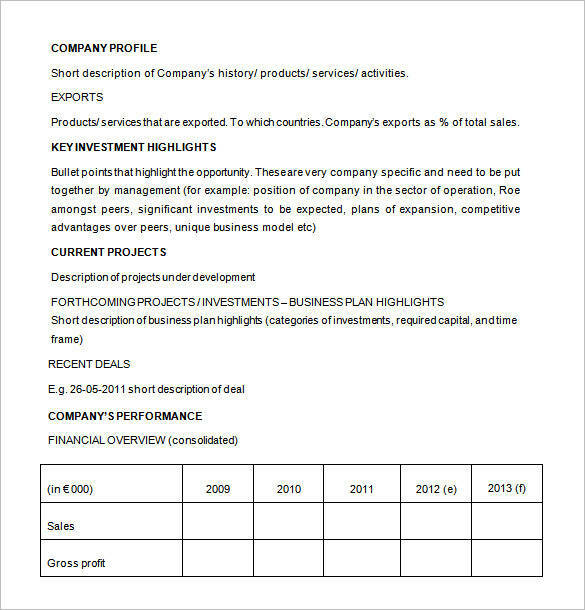 Executive summaries are not only used in investment proposals, but they are commonly written in different kinds of documents either for business, work or for school. 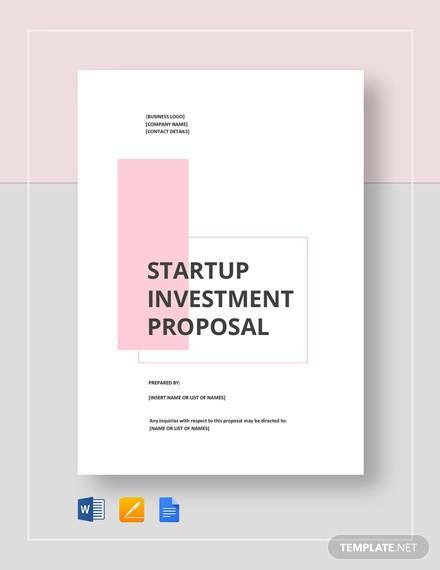 The summary provides a brief overview of the entire business investment proposal that aims to get the attention of the investor so that would be interested to continue reading the rest of the proposal. 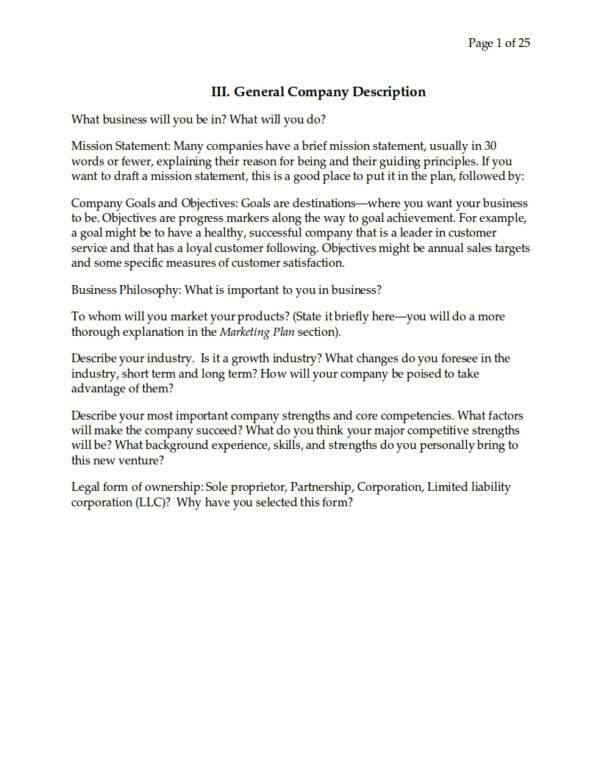 Provide a detailed description about the company or business, especially if it is one that is already in operation. The details include the name of the company or business, the legal structure of the business, names the owners of the business as and their share percentages, subsidiaries of the business, the industry it is involved in, the products and services, etc. A complete list of the products and services offered by the business should be listed here. They should be individually described and their uses should be provided as well. Other details include, how salable they are, their specific target market, the areas or places where they are sold, the materials used, where they are manufactured, etc. How the funds will be used is exceptionally important in a business investment proposal. Provide a clear explanation on how the investment funds are going to be used in the business. Include actual number and provide examples that can help convince potential investors. How are you planning to sell and earn? This is where you list down the marketing plan, sales plan and advertising plan for the business and determine how they are going to help. Describe the type of management that your business is doing. Include the job description of your staff and their duties and responsibilities. This is the part where you provide a description of the owners of the company, their involvement in the management of the business, etc. Also do not forget to include their names, business address, affiliations, expertise, share, etc. This is where you can find the financial statements of the business and others related to its finances. Examples are balance sheets, cash flow sheets or forecasts, forecast on sales, profit and loss statements and many more. Remember these elements the next time you make a business investment proposal. With this, you will surely be able to create one that is of high quality. For more related articles, feel free to visit our website. 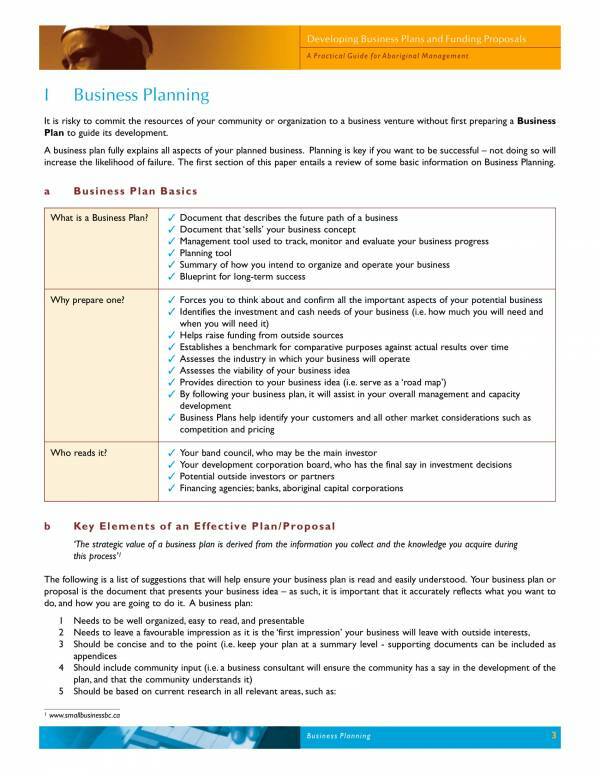 Some examples are Business Proposal Formats and Financial Proposal Templates and Samples.